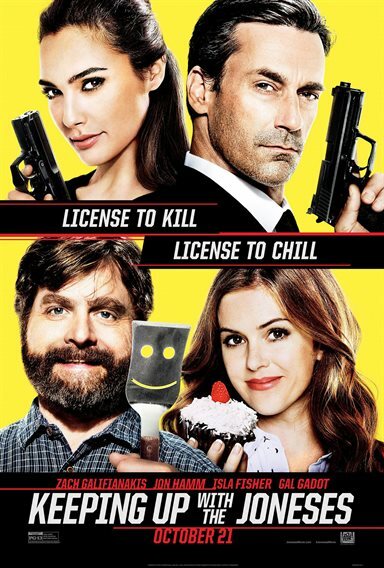 Download Keeping Up With The Joneses in Digital HD from the iTunes store. Keeping Up With The Joneses images are © 20th Century Fox. All Rights Reserved. Spy movies are generally very popular and well received in this country, especially when there is a team of spies. Some are serious films, while others are meant to be comedies or parodies. In 2005, we got spies in suburbia (and real life drama) with Mr. and Mrs. Smith. This year, we once again see espionage come to the world of soccer moms in Keeping up with the Joneses. The film hit theaters in October and is out now on 4K UHD, Blu-ray, DVD and Digital HD. Jeff Gaffney (Zach Galifianakis: The Hangover) is a typical suburban dad. He is the Human Recourses director at an international corporation with low-level security clearance. His wife, Karen (Isla Fischer; Now You See Me) is an interior decorator who works form home. When a home gets sold on their quiet Cul-De-Sac, they, like all the neighbors, are curious about who the new owners are. Suddenly Tim (Jon Hamm; Mad Men) and Natalie (Gal Gadot; Fast and Furious 6) Jones show up and captivate their neighbors, including Jeff and Karen. They are gorgeous, madly in love, and have amazing stories from being world travelers. However, the more Karen watches the happy couple she is adamant that nothing is what it seems… and she is right. Somehow, the Gaffney's get mixed up in an international spy game that, while bringing them closer to their new neighbors, almost gets them killed. The concept for this movie isn't necessarily anything new but it had some potential. Unfortunately, it fell flat in most areas other than as a "bonding" film between two adult couples. The laughs are not there and the script isn't strong enough to be carried off as a drama so it all very quickly falls apart. Writer Michael LeSieur (You, Me and Dupree) doesn't have many credits under his belt and it is evident. The lines are clichéd and the plot is lackluster. Interestingly, the film does have a good cast. Fischer, Hamm and Gadot are perfect for their roles, as is Galifianakis, but he lacks some believability as the mild-mannered, "Touchy-feely" type. I personally am not a fan of his, so that may be swaying my judgment a little, but for someone who is supposed to be very funny; he doesn't appear to be in this movie (although, some of that has to do with the script, as well). The picture quality on the 4K Blu-ray is outstanding. The 2160p high definition video with a 2.40:1 aspect ratio is clear, especially when the house gets blown up. The DTS-HD Master Audio 7.1 is sharp with a wide range of octaves accenting the rumbling lows and the whistling highs. Again, it accentuates the house explosion as well as all the gunshots and the dialogue/audio mix is very well done. The Blu-ray has a few extras for the audience's viewing pleasure. Besides the deleted scenes, which don't add much, there is an 11-minute feature called "Spy Game", which is a look behind the scenes, a 5-minute feature called "Keeping up with Georgia", which is basically a love letter to the State of Georgia where the movie was filmed and a photo gallery. With a talented cast, I was expecting more from the movie but Keeping up with the Joneses is mostly a throwaway film. Besides one funny moment where Jeff runs into a hotel window and a couple of minor plot twists, it doesn't offer much in the way of entertainment. I wish I could have said it was fun, enjoyable and laugh out loud funny, but it just wasn't much of any of those things.